For a brief moment, the anxiety that my brain was staging in my head about our homestay in the Mekong Delta curtsied abruptly and walked off stage. The lizard that had skittered away across the cobwebbed hooks of our room was no longer the protagonist of my thoughts. Nor was I was thinking about our bed, a barebones frame with two flimsy sheets that were a laughable protection from the cold draft slicing about the island air. Thoughts of blood-dripping mosquitoes lurking about the Mekong receded into backstage, as did the angst of sharing one tiny bathroom with the entire household. The dark drama in my head was temporarily muted – here was a mother and daughter, in the 21st century, cooking with 100% local ingredients on a wood-fired stove. Of the two-faced character called authenticity, the face that stared back at me from the kitchen was the face I preferred to see. 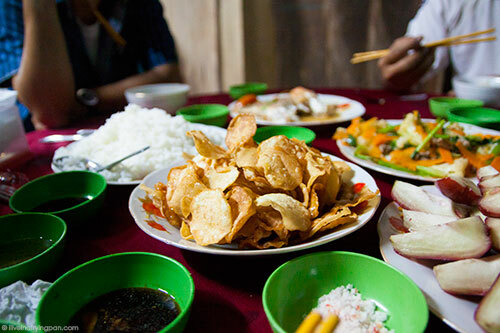 That first night of our homestay, mum and I pattered around our exceedingly shy hostess as she cooked up a feast in the kitchen. 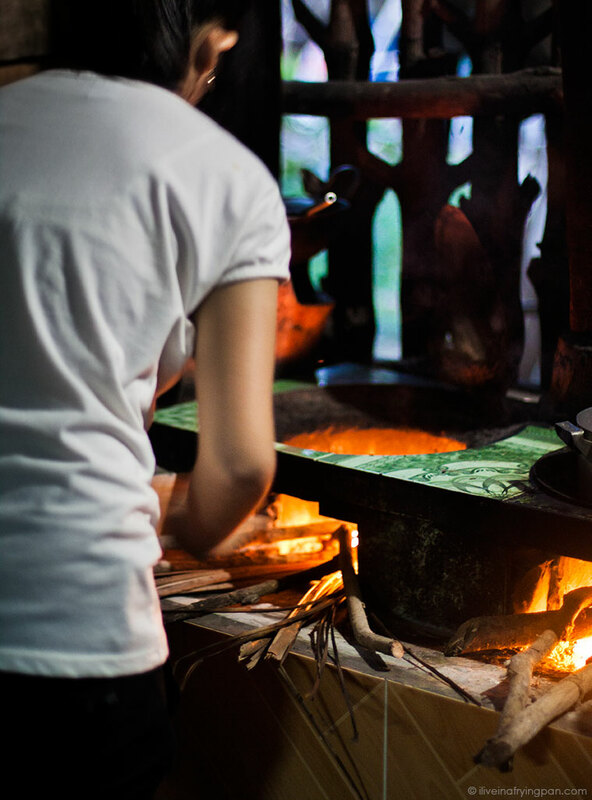 I watched in fascination as her daughter propped up more firewood under the boiling water, readying it to steam the red snapper that had been caught from the water lapping about island. 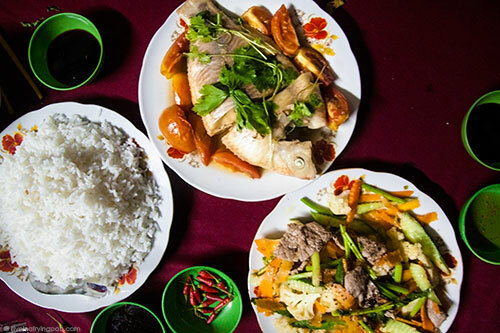 The mother was a picture of silent calm, multi-tasking with practised ease between bowls of beef, macaroni, prawns, snapper, local vegetables and fruits that were likely sourced from her own backyard or the floating markets we had witnessed along the river that morning. It was like watching a slow meditative dance where moments of reflection were frequent through the process, from judging the thickness of the crimped cucumbers to gauging the strength of the diluted fish sauce to evaluating the consistency of the rice flour and duck egg batter for our Banh Xeo demo. The sink was outside the kitchen in a separate enclave for washing dishes and clothes. If this were my kitchen set-up, a guest would have to be content with nothing fancier than salted cucumbers for dinner. 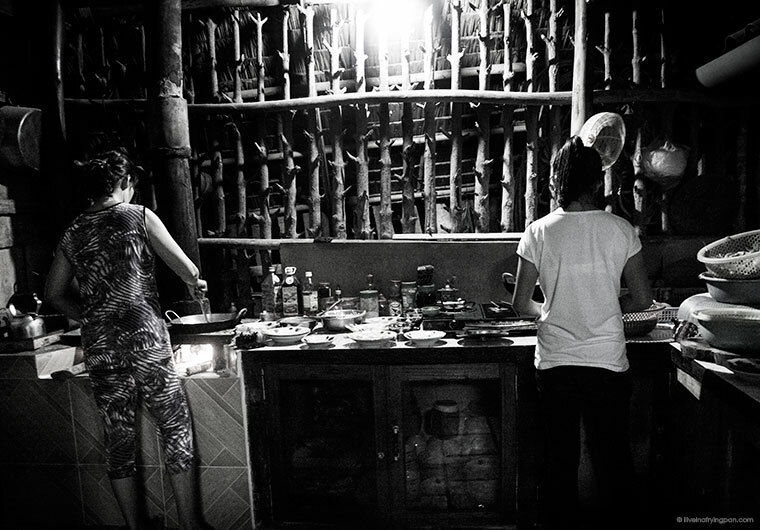 But the two ladies in the family extracted a feast from this skeletal kitchen, a feast that was the most memorable meal through my 5-day stay in Vietnam. The mother and daughter brought out dish after dish after dish, blowing us away with their hospitality, and touching our palettes with flavours that lovingly combined to create an unforgettably heart-warming meal. The ladies did not sit down for an instant, refusing to eat with us because they were busy curating our meal. In retrospect, I feel terribly gluttonous for tucking into the multi-course dinner while the ladies of the house were silently toiling away in the kitchen. But at the time, all decorum was forgotten. 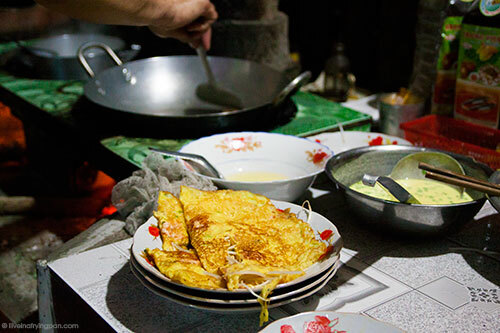 If I slapped my hands from reaching out for fifths of those milky soft Banh Xeo pancakes with crunchy sprouts and pink baby prawns knitted into the centre, it was less because of decorum and more because I knew what dishes were still waiting to make it to the table. My restraint was rewarded with bowls of baby macaroni soup bursting with pepper and the earthy stock of farm-fresh vegetables, creamy chunks of snapper coated in garlic and bedded with fleshy tomatoes, curly strips of beef with wholesome cauliflower florets, sweet potato chips with malt trickling down their wavy edges – and then of course, the customary plate of fruit. 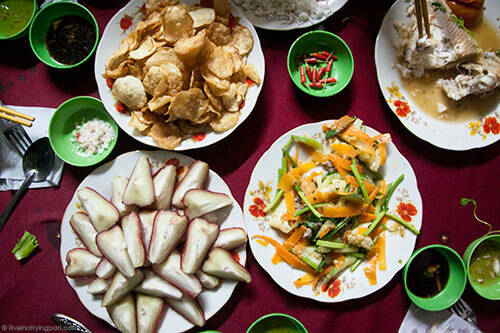 By the time I dipped my last slice of crisp water apple into the dipping bowl of chilli sugar, I was so drugged that my initially uninviting bed suddenly felt like the only place my body wanted to be. Contrary to the cold and mosquito-filled drama my brains had played out earlier, I slept like a baby, didn’t have one mosquito bite to whine about over twitter, and had a wonderfully hot shower the next morning before stepping out into the lush greenery hedging the island. There was a feeling of freedom and zen in the air. There was a connection with nature and an appreciation for simplicity that booed at the spoilt Dubai brat drama staged in my head. 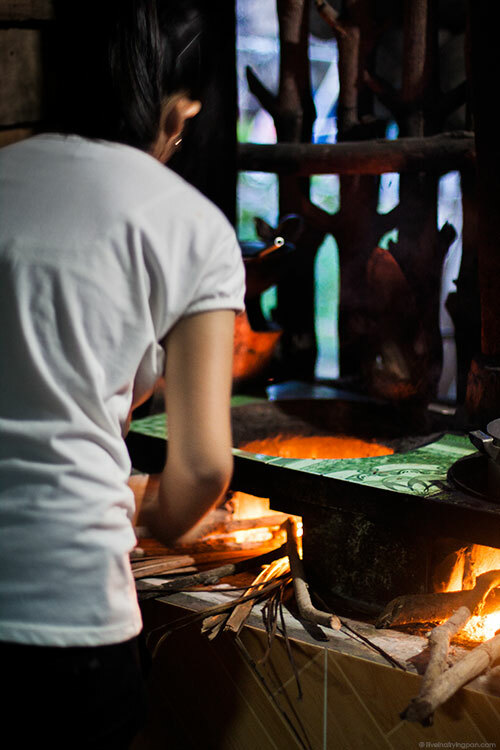 The scene of the mother and daughter silently weaving their way about the stove is one that I will always treasure when I think back to my Vietnam trip. 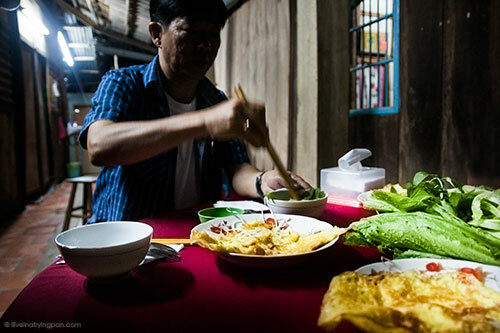 This is a country whose wealth is its simplicity of local ingredients and of self-sustaining life, and you cannot appreciate the paradoxical reality of it all without peering over the shoulder of a Vietnamese mother. We booked our homestay through Backyard Travel, upon the wise recommendation of Lara Dunston at GranTourismo Travels. 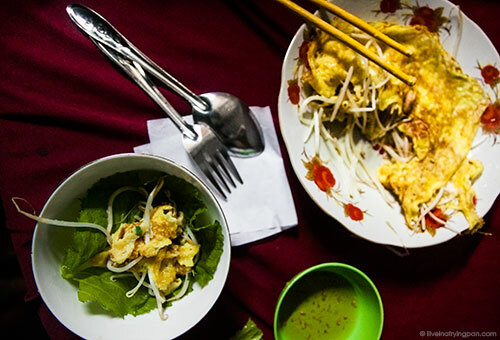 Read about my other favourite eats in Vietnam on a previous post here. ← Older: If you don’t like seafood, try Mahesh. Your body is not happy, that’s why you keep falling ill. You’re not feeding it enough…Soul Food. You lay out all the privations in great detail but your amazing prose and nose for tracking down only the most down-to-earth authentic experiences make me long to sleep under that thin sheet (bring on the mozzies). 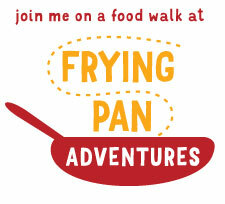 Ahh… the kind of experience that I am always lusting for. Your photographs are good enough to bring out the aroma of the food. Coming from a camera-happy blogger, that’s big – thank you darling! A wonderful story and fantastic photographs. It reminds me of visiting my husband’s paternal grandparent’s home. 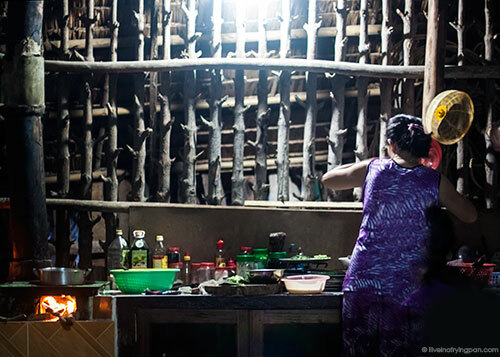 They cooked banh xeo in a lean-to over an open fire in the heat of the day even though they have a kitchen inside. The women and men certainly have their roles, but they’re very welcoming. It’s nice to read your experience.